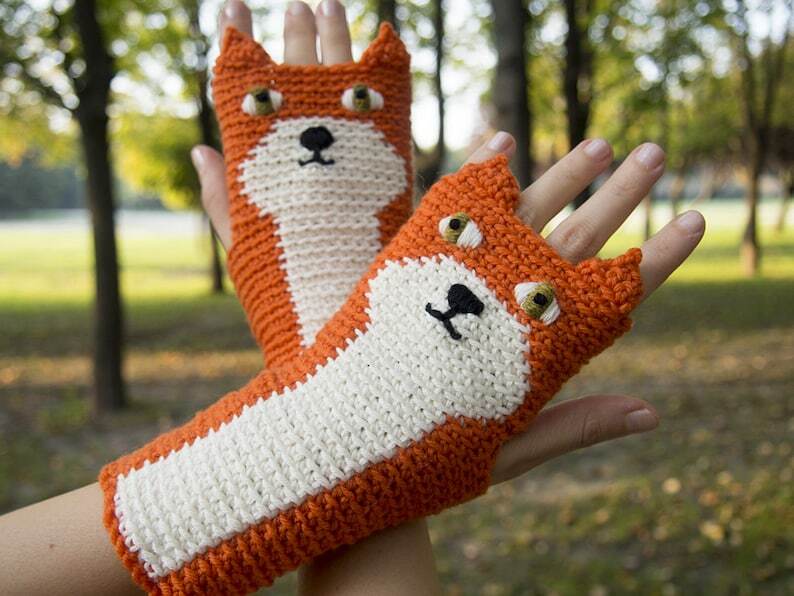 A brand new pair of 'Fox (Orange) Fingerless Gloves'. It was designed and handmade by me for 'The Original Animal Fingerless Gloves' collection. This item is IN STOCK at the moment and ready to ship in 3 business days. Will ship within 3 business days of receiving payment, except when I'm away. In this case I will notify customers as soon as I can. Transit times of the Standard Shipping service are not guaranteed (not time definite) and they can be very unpredictable in November (outside Europe) and December (everywhere). Also, this service doesn't necessarily offer end-to-end tracking. Express shipping is available at an additional cost. Choosing Express Shipping is recommended if you want to ensure that you receive your order in a relatively short time. I send everything registered and in secure packaging. Whenever possible, items from multiple orders will be combined into a single package, if they are shipping at around the same time. About 8 x 19 cm / 3.15 x 7.48" (width x length) without ears and they are stretchy enough to fit slightly bigger hands as well. Yarns (100% Virgin Merino Wool + 50% Acrylic, 50% Virgin Wool + 100% Alpaca). Gentle handwash at 30°C / 86°F. Do not bleach, iron or tumble dry. Dry flat. Dryclean, PCE only. I LOVE these polar bear gloves to bits! I'm sure, we'll become good friends! So adorable! I wish I could give them now, but I'll try to wait until Christmas. Quality work. Such a beautiful piece of work. The yarn choice is perfect! Beautiful! I would buy again! Panda Belt ~ Handmade ~ LAST ONE! Male Mouse Belt ~ Handmade ~ LAST ONE! Rabbit / Bunny Belt ~ Handmade ~ LAST ONE! Butterfly Belt ~ Handmade ~ LAST ONE! Female Mouse Belt ~ Handmade ~ LAST ONE! Owl Belt (Metallic) ~ Handmade ~ LAST ONE! Bear Belt (Metallic) ~ Handmade ~ LAST ONE!